Automatic valve pocket packaging machine is mainly used to weigh the powder, small particles or sheet material and filling the valve bag packaging equipment. This equipment is a gross weight weighing machine, and its specially designed fluidized bed system can be packaged with high efficiency and high precision. This series of equipment configuration the best quality pneumatic and electrical components to ensure its durable, easy maintenance, the use of low cost advantages! 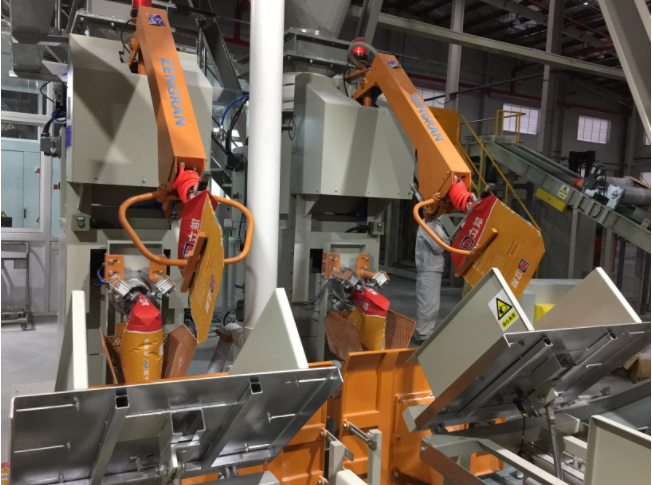 After years of development, Anhui is far from being used to improve the use of the latest automated components, from simple configuration of the artificial bagging to the robot automatic bagging, a variety of configurations to meet the needs of different packaging machine automation. At the same time can be configured to achieve from the packaging to the palletizing of the automatic production line. Application︰ Automatic valve pocket packaging machine is mainly used to weigh the powder, small particles or sheet material and filling the valve bag packaging equipment. This equipment is a gross weight weighing machine, and its specially designed fluidized bed system can be packaged with high efficiency and high precision. This series of equipment configuration the best quality pneumatic and electrical components to ensure its durable, easy maintenance, the use of low cost advantages!